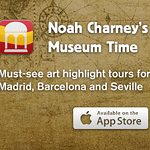 Noah has written art guides for the Museum Time app and the Pocket Guides app. Museum Time This guide provides a private tour of the best of the museums of Madrid, Barcelona, and Seville. Listen to renowned art historian, Professor Noah Charney, tell you the secrets, symbols, and stories behind a selection of must-see artworks in top museums throughout the city. Read or listen to the information provided. This is an essential travel accessory for art lovers, a fascinating and fun way to appreciate the art, and get the most out of your museum visits. Museum Time guides allow you to see art in an entirely new way. This app takes you on a private guided tour of a special selection among the greatest artworks in the museums of Madrid, Barcelona, and Seville. Internationally-renowned art historian Noah Charney leads you through each museum, explaining the history, symbolism, secrets, and importance of each work selected. It is a private, guided tour with a knowledgeable and engaging professor. Noah Charney, a best-selling author and professor of art history, draws you in, bringing to life the stories behind the artworks, and imparting important lessons about history and the history of art, as taught through the prism of individual masterpieces. This is an essential travel accessory for art lovers, a fascinating and fun way to appreciate the art, and get the most out of your museum visits. Guides are available to the museums of Madrid, Barcelona, and Seville, with more city guides to come. Pocket Guides Noah has written a guided tour of the greatest art and architecture of Florence and Venice, for the Pocket Guide app. Pocket Guide Apps use GPS software to help you navigate the city you are visiting and to find the major historical and cultural sites of interest. When you reach each new site, the guide knows that you are there and automatically begins to tell you about what you see. You can control the guide, listen to a narrator tell you about the site, or you can read the information yourself. The guides feel like having a private guided tour with an informed and entertaining professor. The guides to Florence and Venice can be tailored to any length you like. If you have only a short time in these magical cities, and would like some guidance to the must-see art of the city, then this is an ideal tour. It provides a sample of the best art of Florence, from world-renowned museums to treasure-house churches. For those who would like expert advice and guidance on which works are worth the journey, then this is the only guide you will need. All of the major art sites are included in these tours, as well as many hidden gems. The guide is written by best-selling author and professor of art history at American University of Rome (and author of The Secret History of Art blog series), Noah Charney, who taught art history in Florence for several years.